Tempo King and His Kings of Tempo was a group clearly patterned after Fats Waller with Tempo King providing the vocals and Queenie Ada Rubin playing a convincing Waller-like stride piano. 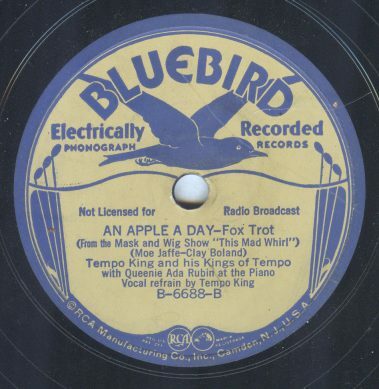 Despite the fact that the group recorded a few dozen sides for Bluebird and Vocalion in 1936 and 1937 very little biographical information about either artist seems to have survived. The only information that I was able to find about Queenie Ada Rubin was that she was based out of New York and was active in the swing era Fifty-second Street jazz clubs. This entry was posted in 1930s, 1930s Popular Music, Electrical Recordings. Bookmark the permalink. I recently purchased some sheet music of a song called “Am I Dreaming?,” which has small portrait photos of many bandleaders, famous and obscure. Wonder of wonders, there’s a picture of Tempo King. After hearing him on the Timeless-Historical CD and reading the notes (in which the writer admitted there was next to nothing known about him), I was thinking that this might be a pseudonym, but no, there he was. I have been intrigued by the “Tempo King” group ever since junking their “You Turned The Tables On Me” on local Regal-Zonophone MR-2323 in the late 1940’s. What caught my attention was (1) the pseudonym Queenie Ada Rubin(2) the drummer being Stan King (i.e. the tempo king). (3) Eddie Condon being present on guitar and (4) the slightly disguised piano style of Waller. It would not be the only time that Waller used an alias when recording (and with Condon present! ), and the choice of a female name is also in character. Recording initially for Vocalion (and not Victor) would also possibly require such subterfuge. I have tried, in vain, to locate Waller in some other location when the Tempo King recordings were made, but no help there. Careful listening seems to detect” Waller like”comments in the background. I’ve always been surprised that nobody else seems to share my suspicions regarding these recordings, no doubt someone will oblige with the reasons why!! The only other mention of Tempo King in Rust by the way is on a recording session of Frank Froeba in 1936 where interestingly Joe Marsala is also present again.